For Jennifer Bennett, a recent MU graduate with an MFA in Art with a focus on Fibers, this statement could not be more actuate. As a Missouri-based artist, she draws her influence from the rural landscape around her. Born and raised in Mid-Missouri, Bennett was deeply influenced by the culture and landscape she experienced growing up. Over the years, her life and art have become one, leading her down an incredible path of creativity pulled directly from her past and the very soil from which she grew. Art is all around us, because art is in everything. Anything can be an inspiration to create. It was pretty quiet growing up in Ashland. Bennett spent a lot of her time with family, and many days going to antique shops with her grandmother. Her family lived off a gravel road with just a few neighbors, surrounded by pastures, cropland, and the agricultural industry of the Mid-Missouri region. Farming and agriculture were a part of her daily life. “We had a family garden,” she explained. “It was corn, cucumbers, beans. It was anything and everything.” Anything and everything that could be shared among family and neighbors. Living here, Bennett was able to see the effects of the Mid-Western farming crisis of the 1980s. Well, one of her interests, that is. Years later, these experiences continue to shape her focus as an artist. It was not a straight march to graduate school for this artist. After concluding an undergraduate degree, Bennett took some time away from academics to experience the world around her. “I’m more of a multi-interest person, and not a strict planner,” she said. “After undergrad I just took opportunities as they came.” Bennett worked in various jobs and went where the wind took her. But her artistic inspirations followed her everywhere, and she soon decided that she had something else she wanted to accomplish with her art. Though she imagined that she would continue drawing, she rekindled a love for working with fiber while taking one of her first MFA courses. Bennett may have begun by working with paper, but she was quickly enthralled by the legacy of the handicrafts that had surrounded her childhood. She drew on the work of her mother and grandmother to make art through the techniques used in quilting, weaving, and crochet. This turn eventually became the groundwork for her thesis project Becoming Aware, a large crochet piece that weaves together the handicraft of crochet with a conversation about agricultural change and its effect on native pollinators. Honey Bees are now relied upon heavily to pollinate expansive monocultures that have wiped out native habitat and pollinators. 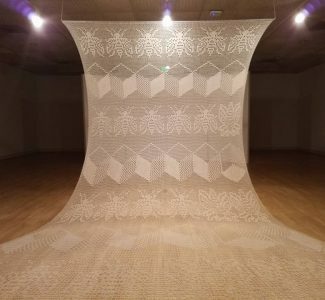 Hanging 8ft off the ground and sweeping out across the George Caleb Bingham Gallery floor, Becoming Aware’s large dimension seems absurd for a piece of crochet. The 16ft wide cloth is much larger than traditional crochet products: smaller pieces like accessories and clothing with blankets being on the upper end of the scale. The piece’s size, however, is a part of its message. Bennett chose this method, because crochet is very malleable. It distorts under the weight, or “the weight of the issue,” as she put it. She completed the piece by using “filet crochet,” which is a lace-making technique. It’s a rather simple method of two stitches to make a pattern of squares. Bennett built the design off of a grid pattern, but when it hangs, the piece stretches into a more hexagonal shape similar to how our relationship to food has been distorted by big business models. Bennett’s crochet work is made from a highly manufactured cotton yarn as a comment to the industrialization of this monoculture crop. Bennett used this material, because the growing of conventional cotton is harmful to local ecosystems. Honey bees, butterflies, birds, and other local pollinators are disrupted because of the shear impact of large monocrops. Bennett embedded images of bees and hives into the piece. Crochet as a method allows the artists to put images directly into the cloth while working through each row of loops and knots. “Honey bees are really imbedded in our agricultural practices, monoculture practices,” Bennett explained. The imagery within the cloth expands and grows larger from top to bottom. Bennett did this by using larger crochet hooks as she worked. Bennett hopes to show Becoming Aware at more venues, because her piece highlights an issue that she wants to keep talking about.